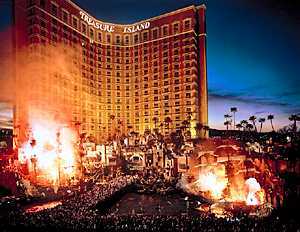 From the plunder-adorned lobby to the beautifully appointed guest rooms and suites, Treasure Island is a haven for discriminating pirates. Treasure Island offers seven fine restaurants sure to satisfy any seafaring buccaneer. Enjoy gourmet cuisine while viewing the raging battle at the Buccaneer Bay Club or partake in a more casual dining experience at the Black Spot Grille. Feast on sumptuous buffets from every port of call at the Treasure Island Buffet. Relax by the tropical pool, or plunder down our shopping promenade, The Pirate's Walk. Standard - Known as "The Royal Chambers". 1 King or 2 Queen Beds. Tower - 780 sq. ft. Mini Suite 1 King Bed. A Living Room Parlor, No Sofabed, which connects to a separate sleeping room with a King Size Bed, 2 TV, 3 Telephones, a Refrigerator, Bathrooms have Spa Tubs and a Separate Shower. Color TV with remote, Pay Movies, Cable, Air Conditioning, Telephone, Computer Hook-Ups, Radio/Alarm, Hair Dryers.